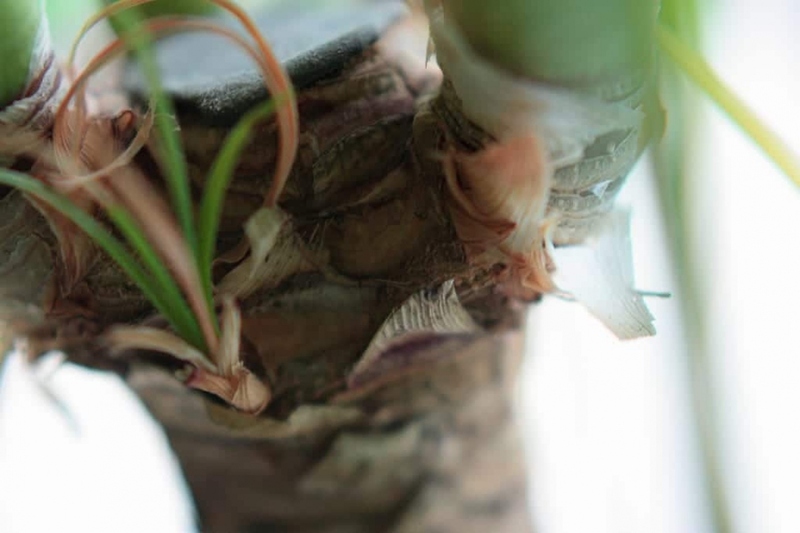 Elephant's foot (Beaucarnea): growing, planting, caring. The elephant’s foot is easy to grow ! Just follow the instructions. Beaucarnea is a genus of flowering plants native to Mexico and Central America. They are small tropical xerophytic trees growing to 6–10 m tall, with a trunk 20–40 cm diameter with a flared base - young plants are single-stemmed, and branch only after flowering. The leaves are evergreen, linear, strap-shaped, 0.5-1.8 m long and 1.5–2 cm broad, leathery in texture, with a finely serrated margin. The flowers are only produced on old trees, forming on large panicles 75–110 cm long, the individual flowers numerous but very small (1.5 mm diameter), greenish-white, with six tepals. Beaucarnea recurvata - Elephant's foot, ponytail palm - is one popular species cultivated as an ornemental plant : an evergreen perennial growing in its original habitat to 15 feet 6 inches (4.72 m) with a noticeable expanded caudex, for storing water. The single palm-like stem produces terminal tufts of strap-shaped, recurved leathery leaves, sometimes hair lock-shaped in the ends, and with occasional panicles of small white flowers once the plant reaches over 10 years of age. Your beaucarnea needs light but no direct sun. Avoid tanks with water reserve, its roots can not withstand constant roots in the water - and instead provide a well draining substrate. Water your beaucarnea in pot once a month, no more even during the hot weather, or even less in winter. Prefer lukewarm water. Know that it prefers a lack of water that excess watering that could cause the roots to rot! Check also, a few minutes after watering, that there is no moisture in the saucer... Outside, no watering is necessary. In early spring, you can reduce the length of the leaves of your beaucarnea to give it a beautiful silhouette and a more compact effect. Cut the leaves diagonally so that they continue to curl. At the end of winter every 3 or 4 years, repot! 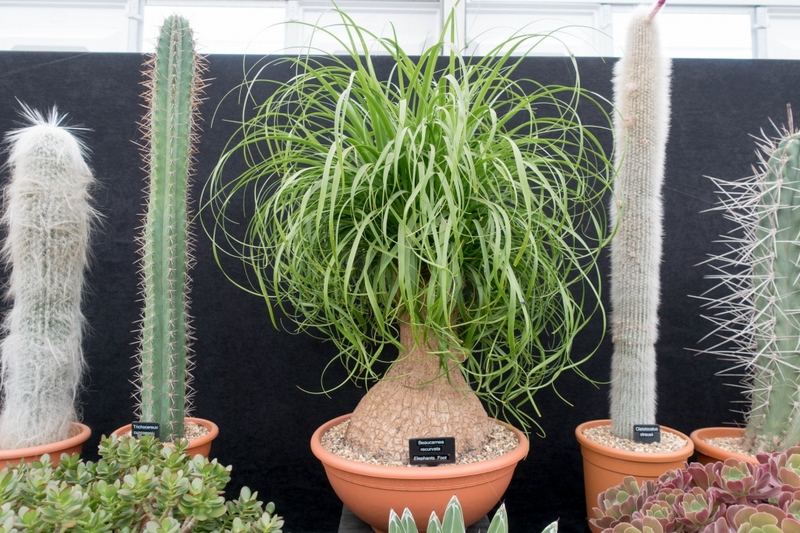 Not necessarily to change pot: the beaucarnea likes to be cramped, but you must renew the substrate. Remove the dry clump, and gently remove the old soil. Throw pebbles, clay balls, small stones for drainage into the well-cleaned pot, and add potting soil, mixed with some garden soil, all up to a third of the height of the pot. Unpot, unclamp the roots, position the mound on the potting soil, and fill. Tamp rather strongly, and water! The next watering can be done in two to three weeks: let your plant dry a little to make roots. The beaucarnea is very sensitive to mealybugs, small brown insects often present in large numbers on the leaves. You can sometime see white felting on the back of the leaves. Be careful, watch and treat as soon as possible! To fight against mealybugs, simply clean the affected leaves by passing a cotton swab above: the mealybugs will hang on it. Feel free to take your beaucarnea outside for the summer! Avoid simply plopping it down in full sun; let it acclimatize slowly and, of course, keep an eye of watering! Take it inside at the end of the summer. Put your beaucarnea inside in the end of September, and provide a bright location! You should water less in winter.